No one typified suave and sophisticated quite like him. He had made his mark as globe-trotting spy Napoleon Solo in the 1960s and 1970s, then continued that on into the ‘80s with a variety of roles, including one last turn as Agent Solo. Robert Vaughn passed away at the end of last year, but not before he left behind a legacy of debonair characters, with tongue still planted firmly in cheek for a bit of comic relief. of the Man from U*N*C*L*E: The Fifteen Years Later Affair"
Robert Vaughn really was the Man from U*N*C*L*E, saving the world on a weekly basis and ridding it of those pesky, nefarious agents from T*H*R*U*S*H. However, his time as an international globetrotter came to an end in 1968. After that, he would take guest starring roles in ensemble shows such as “The Love Boat”, “Hotel” and “Trapper John, M.D.”. Then, in 1983, the impossible happened. Well not really, because television has always had a way of making these reunion movies. But Man from U*N*C*L*E was having a reunion of its own, fittingly subtitled “The Fifteen Years Later Affair”. Robert Vaughn returned to the role he was most famous for. 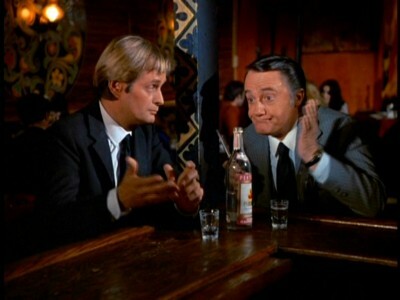 So did David McCallum, reprising his role as Solo’s sidekick Russian operative Ilya Kuryakin. It was a great movie, with a hint it might go to series, but never did. Still, Solo and Kuryakin saved the world one last time together. The 1980s was littered with night-time dramas, that is soap operas, that attempted to capitalize on the success of “Dallas”, “Dynasty”, “Knot’s Landing”, and “Falcon Crest”. Another feature of these shows was their use of old movie stars and notable names to supplement their casts. Jane Wyman and Lana Turner were on “Falcon Crest”; Bette Davis and Anne Baxter on “Hotel”; and Elizabeth Taylor on “General Hospital” and “Dynasty” were just some examples. Robert Vaughn filled this bill, making an appearance in “Emerald Point NAS” a star-studded night-time drama featuring Dennis Weaver, Maud Adams, Patrick O’Neal, Sela Ward, Jill St. John, Susan Dey, Richard Dean Anderson, Andrew Stevens, Robert Loggia and many others. It was set on a naval air base but, like “The Yellow Rose”; “Glitter”; “Paper Dolls”; and “Berenger’s”, it just never attracted an audience and lasted less than a season. Vaughn played Harlan Adams, described as a scheming industrialist who was yet another suave and debonair character. In this case, Vaughn actually took over the role of Harlan Adams from Patrick O’Neal, who had tired of travelling from his home in New York to do the series which filmed in California. Robert Vaughn, at right, with fellow bad guy Richard Pryor in "Superman III"
Vaughn was back in 1983, this time on the big screen, in the third installment of the “Superman” movies. He played Ross Webster, an evil millionaire out to kill Superman, enlisting the help of a seductress, played by Pamela Stephenson, and a warped petty criminal and computer whiz played by Richard Pryor. 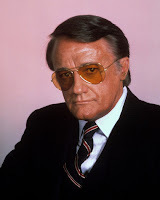 It was the first time I ever saw Robert Vaughn play a bad guy, and he was really good. Still suave and sophisticated but, because of his nefarious motives, made him look cold and calculating. It was just the other side of the same coin, really. 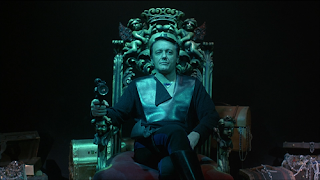 Robert Vaughn as Gelt in "Battle Beyond the Stars"
Although I saw it after “Superman III”, Robert Vaughn had another role in science fiction in a made-for-TV movie called “Battle Beyond the Stars” made in 1980 by "B" movie king Roger Corman. The movie starred Richard Thomas as Shad, essentially a farm boy in space, whose planet is threatened by Sador, played by John Saxon, who was as bad a guy as there was. He suffered some kind of debilitating illness so, to survive, he would graft the amputated parts of aliens he would capture onto his own body. He just epitomized sinister. Shad manages to round up a strange group of aliens including the “Space Cowboy” played by George Peppard, and a symbiotic race called the Nestor who all moved in unison, to fight Sador. He also recruited Gelt, played by Robert Vaughn, a wealthy assassin who is just looking to hide out. It was a really good movie for 1980, and one I would watch again. I love the idea of a battle against the odds where the underdogs have to gather together a gang to battle the seemingly overpowering enemy. “Battle Beyond the Stars” was another one of those movies I had read about in TV Guide years before seeing it on Channel 13 on peasant vision. Robert Vaughn in "The A-Team"
Another show that starts out with a team being recruited to go on adventures was the “A-Team”. It was already in eclipse, some even describing it as “jumping the shark”, when Robert Vaughn joined the cast for the show’s fifth and final season. The “A-Team” had been captured by the army and forced to work with them now, under the command of General Hunt Stockwell played by Vaughn. This was in 1986-1987, my Grade 12 year, so by now I was not watching as much TV as I had been, and I never saw one episode of that final season or Robert Vaughn in it. That was probably a good thing. Vaughn also had the perfect voice for narration. What I remember most was an episode of “The Late Show with David Letterman” in 1987 where Vaughn came out and read from the Bangor, Maine phone directory. It was so funny, capitalizing on Vaughn’s voice, which was perfect for narration. Letterman had done something similar when he had James Earl Jones read out figure skating scores with that unique “This is CNN” voice of his own. It’s funny. When I watched the remake of “The Man from U*N*C*L*E” last year, Henry Cavill did a good job as Napoleon Solo, but there was something missing. Sure, he was sophisticated and had tongue planted firmly in cheek but he really was – just not Robert Vaughn. No matter what role he played, even reading names from the Bangor, Maine phone directory, Robert Vaughn was the epitome of class and sophistication, with not a hint of arrogance, because he just never took himself too seriously. That is what made Robert Vaughn unique, and he will be missed.